This study is a component of a three-year project titled “Safe Labour Migration for Vulnerable Cambodian Migrant Workers”, known as MIGRA SAFE, coordinated by the Civil Volunteer Group (GVC) in cooperation with the Cambodia Women’s Crisis Centre (CWCC) and Phare Ponleau Selpak (PPS). 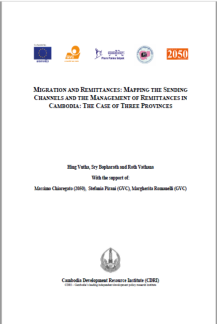 The research is committed to understand the remittance behaviour of Cambodian migrant workers and the effects of remittances on the livelihoods of their families. The primary data for analysis were collected from a household survey of 500 migrant households conducted in the three provinces of Banteay Meanchy, Siem Reap and Battambang in September 2015. The study, through comparative analysis targeting before and after migration periods, demonstrates the immediate positive effects of migration flows on household living conditions.